A dashboard cam is a camera that is placed on your windshield or dashboard and is continuously recording everything that happens while you are driving the car. More advanced version of the cameras can also record rear views; some are equipped with infra-red sensors to enable recordings in the dark too. The camera automatically switches on and begins recording as soon as the car engine starts. It saves all video data to a memory card. Some cameras are capable of recording in High Definition and deliver great video quality. This is a particular technology that can be quite interesting for many drivers. It is mature and extensively used technology in several countries where accident and insurance fraud appears to be a problem (e.g. Russia, China). Is it a good idea to have such a device on board of a car? I think so! The camera is your objective witness and can “speak” for you should something happen. It can be an accident due to an unexpected maneuver from the car in front of you or a fraudulent accident that is almost impossible to recognize or simply a situation that will require a detailed examination later. Whatever it is, a dashboard cam will be there to contribute to finding out the truth. Is data privacy a concern in this case? I do not think, as long as the video stays with the car and is not transmitted elsewhere. At the moment most dash cams use a memory card which is constantly being re-written since video is recorded in a loop. This results in only the last few hours or days of the video available (depending on memory card’s size). There are two organizations that would probably benefit the most from such a device being used by consumers: insurers and law enforcement. This is because a dash cam can greatly contribute to the resolution of traffic accidents and claims. I am not sure how police sees the idea of dashboard cams in ordinary cars but police cars are equipped with this technology to document road situations. I would imagine they would embrace this technology as it would only facility their jobs. My hypothesis is that you should make use of dash cam data in discussion with police or in the court to make sure that you are not considered to-be-at-fault. Not being considered at-fault after an accident could help prevent your insurance premiums from increasing. Additionally, a dash cam can help to preserve a clean driving record. Outlook: What Could Dash Camera Become in Future? Is there any future for a dashboard camera? Absolutely! I think it can contribute to both the correct assessment of traffic accidents and to better driver behavior. You’ll get a “trustful” witness who always “sits” in your car and can prove your points but the same observer will ensure that you are not making any mistakes since these will be recorded as well and the data could be used against you. Insurance discounts: One of the scenarios that I could imagine is the appearance of insurance products linked to having a video camera in your car e.g. dash cam insurance discount for those drivers who decide to install such a device. In fact, dash cam material can significantly reduce claim-processing time for insurers since claim adjudicators can find out the truth much faster. New insurance product for consumers: Tape-as-you-drive insurance can be also more attractive for consumers if they get the feeling that their case will be assessed very precisely with help of a camera instead of using a predefined 50-50 rule for handling cases as many insurers do today. An example could be a side collision of two cars on a road when it appears that both were on or over the center line (so called “sideswipe”) and there is no way to prove it without a video recording. Built-in car option: Furthermore it’s possible that adapted versions of dashboard cams could find their way into mass car production as a special feature. Having such a car with an officially certified camera could be recognized in insurance premiums like winter tires, alarm device or hybrid vehicle. Just think about other means of transportation such as planes or ships – they are all equipped with a black box recording everything that happens. Why should a car be any different? Extension of pay-as-you-drive solution: There is a so called pay-as-you-drive insurance that is being successfully offered by several insurers. Pay-as-you-drive insurance calculates premiums according to an individual’s driving behaviour, rewarding secure driving while tracking and increasing insurance costs on dangerous driving styles. A “black box” device installed in the vehicle tracks key parameters of the journey and transfers the data to the insurer, who then regulates the premium rate. Dash cam is a logical extension of this insurance that can complement it with more data and insight. Fun, fun, fun: One fun use of a camera in a car is when doing a road trip – you could easily create a nice road trip video combining the best video pieces. Dashboard cams can get a lot of work done for you! 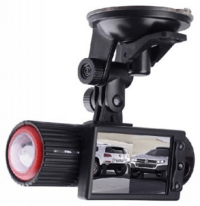 Where Can You Find a Car Camera? Well, I got mine couple years ago via Ebay. I believe you can get dash cams now both on Amazon (Dash cam section on Amazon) or Ebay (Dash cam section on Ebay). Links are mentioned solely for the benefit of the reader as we do not endorse any of them. A decent camera would cost around couple hundred dollar, there are also cheaper options but obviously the quality (especially battery) is not that high. InsurEye Inc. is a Canadian company that provides online tools for consumers to educate them about insurance and create transparency in insurance market place in Canada. Insurance Price Comparison Tool is based on aggregated consumer data and helps to compare your insurance premiums to the premiums paid by your peers. InsurEye Consumer Experience Tool is an independent platform for consumer insurance reviews. It covers most home, auto, and life insurers and their products across the country and is free for Canadians to use. A camera on a dash would be a great target for vandals or thieves. Bizarre concept for an insurer to tout its benefits. Actually the cam screen can be folded and the small cams look often more as a garage door opener. For those who prefer do not leave a cam inside – it is easily dismounted, very similar to a GPS. Auto insurance companies in South Korea offer 5% discount for owners who provided serial number and model of dash cam. Is there any schedule or insurance company who offers any discount for dash cam equipped car owners? If you consider the recent Russian meteorite, it’s thanks to these types of cameras. Yes, they have insurance issues in Russia. Cameras are not a bad thing at all. Heck, because of them we got to witness a fireball in the sky.